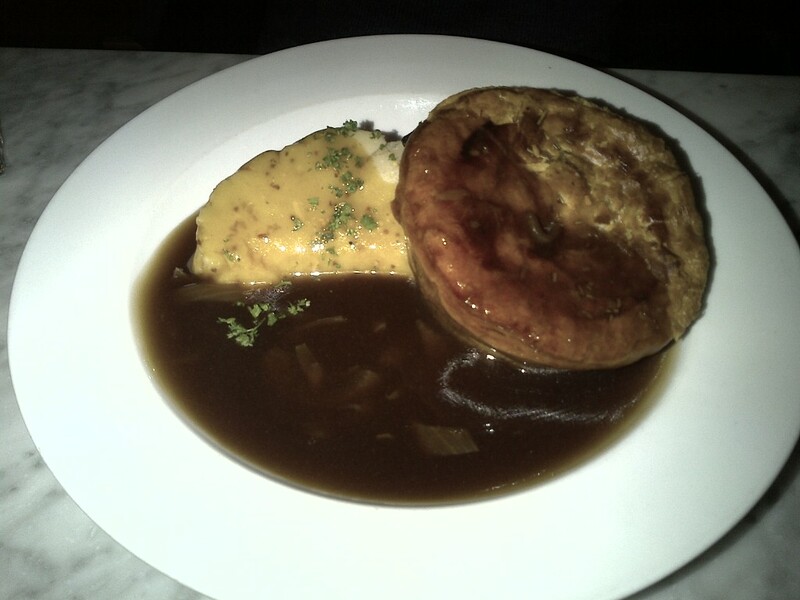 Now that winter has truly set in, I long for hot stodgy food. Gone are the days of salads for lunch and light dinners, after all, the body needs fuel to keep itself warm during this cold season. Despite my general longing for comfort food, I was organising dinner with a friend and decided on a fresh and healthy Vietnamese restaurant. Except on the day and after walking half way down Oxford Street in close to sub-zero temperatures, the plan was soon quashed. As we walked down Carnaby Street I suddenly remembered a restaurant I had read about some time ago. 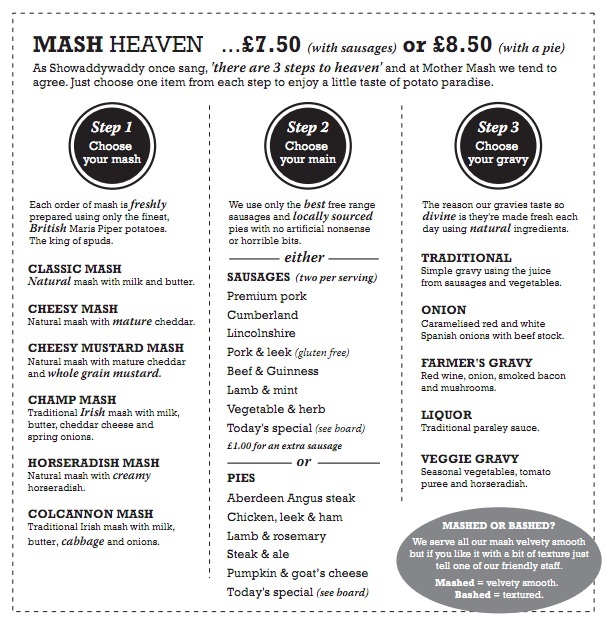 Mother Mash is located on Ganton Street and is a small alley restaurant that specialises in, you guessed it, mash. We walked in and were seated right away. The waitress came to take our orders within 10 minutes, advised us of the specials and then left us to whale away the time whilst waiting for our food. 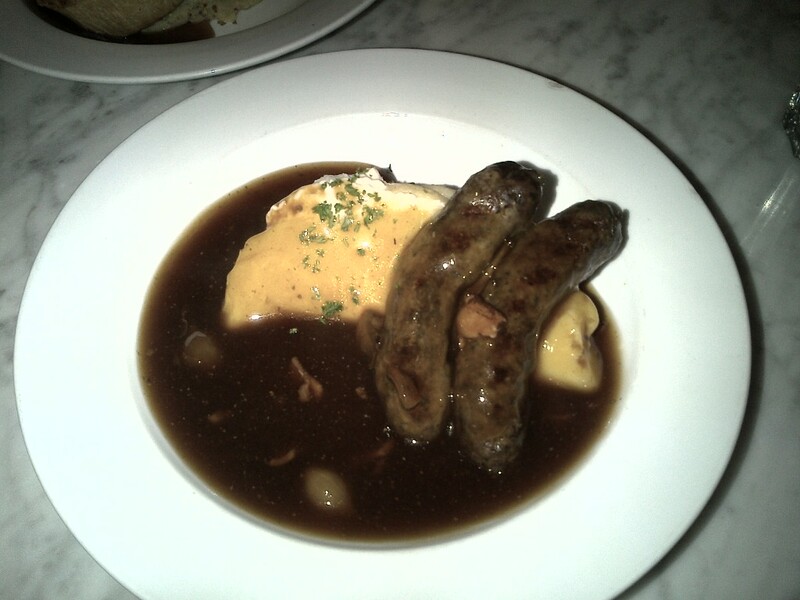 I ordered the horseradish mash with lamb and mint sausages and the farmers gravy (Red wine, onion, smoked bacon and mushrooms). This was truly fast food, more so because our meal arrived within approximately 6 minutes of placing our order, not that we complained. We dug in right away. Whilst my sausage was nice, it wasn’t bursting with flavour and was a little bit dry. The mash was creamy and smooth, I just wish the horseradish flavour had been a little stronger, however I guess that’s personal preference. The gravy however was yum! When I asked Miss P for her review, she advised me that the pie had a nice flavour and the pastry was nice a crumbly, the mash was just mustardy enough and they hadn’t gone ott on the cheese. As for the gravy, Miss P said ‘the onion gravy was like gravy with onions’ – there’s a revelation if I ever heard one! There are veg options, although I’m not sure if these contain egg. There’s also a selection of sides, salads and homely desserts including ginger bread pudding, sticky toffee pudding, apple pie and apple crumble! The bill came to an extremely reasonable £16.50. On the whole I love the concept and with an array of choices on the menu, I’ll definitely be going back to savour some of the other options!